I scored 34. But I am colourblind according to the ishihara tests, which is why I don't get into arguments about colours. Can you believe I worked in a hardware store mixing paint and giving out colour scheme advice for 2 years? Only a few customers noticed... and only one yelled at me for working as a paint mixer when I'm colorblind. I just looked up the "ishihara tests" mentioned above, and yup, I definetly have a hard time seeing some, and can't see one particular one at all. The blue on dark gray messes with me as well, though it really depends on the angle i'm looking at the monitors as well. When I slouch down in the chair, I can see it better since the contrast ratio of these LCD's improves at that viewing angle. I got 14 rushing through first go. Might have another go later. @TTerbo - The lower, the better. People on crusty ol CRTs are going to have the real advantage here though. I got a 12. Not bad for an uncalibrated cheap Dell LCD. With calibration I'm guessing I'd get a 6. I was using my laptop when I took it, and it has a 10 bit display. 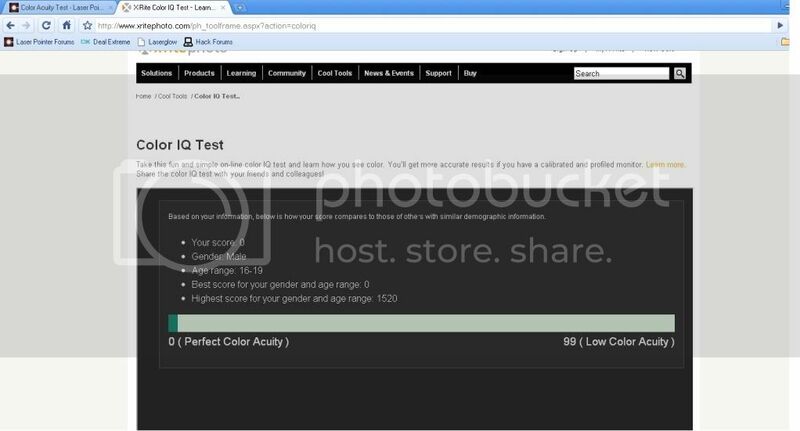 Also color calibration shouldn't affect the test much. all that will do is shift the colors up or down a bit. At most it would just shift the areas where the test says you have problems up or down the spectrum a bit, but it shouldn't change your overall score. stop blaming your screens lol. the colours should still be different hues relative to each other, unless your monitor cant even produce any difference if 2 hues are too close. i got to say not as good as i would have hoped. but then again i am doing it on my lcd tv maybe time to break out a tube and try it there, my tv is a bit darker than any other monitors i have had. I knew I was the chosen one. Wow I guess I am red-green color blind. I see a 2 in the image below. People with regular vision should see a 5. I'ma try it on my 42 10 bit when I get home. It varies greatly screen to screen though. I had mine calibrated at one point but now its set to have a bit more pop (power went out for a few hours, didnt feel like calibrating again lol). Compared to my 19" and 22" monitors though, my TV usually has the best color representation and contrast. Go look at the wall of TVs in bestbuy some time though, huge differences between them all. Most correctable within the menus, but who does that other than AV geeks?